For all of the febrile and frenzied attention that the EDL attract from their opponents in UAF, Hope Not Hate and Searchlight, one could be mistaken for thinking that these three letters possess some kind of extraordinary magical power capable of inducing a state of mystical ecstasy amongst the ‘elect’ of the ‘anti-fascist’ sect. The sectarians apparently share a belief in a demoniacal presence, to which they give many names and perceive to be at work in many places; and in their conviction that this is so, they take to the streets and solicit public professions of faith in, and support for, their cause, the absence of which is taken to signify infection with, or sympathy for, the ‘devilry’ that they seek to drive out. As such, the self-styled ‘anti-fascist’ and ‘anti-racist’ movement is not so much founded upon reason, as upon a delusional fantasy in which a potential Nazi or Breivik lurks around every corner and behind every white smile. So it is that yet again the highly predictable decision has been taken by UAF to congregate in Leicester this Saturday to chant their limited liturgy: “Whose streets? Our streets!" "Nazi scum, off our streets!” “Black and white, unite and fight!” etc, etc. It is boring and meaningless of course, serving no other purpose than to engender a sense of commonality amongst the self-righteous, revelling in their public display of politically correct piety and hatred for the anathematised within the EDL. How do the UAF organisers profess to see this though? Leicester UAF has produced an article eliding a number of popular leftist pietistic clichés within its heading: “Holocaust – Never Again – Racist Murders – Never Again: Stephen Lawrence – Never Again – Anders Breivik – Never Again.” Quite why such a title heads an article about the EDL protesting against the racist attack on Rhea Page and other analogous cases is beyond me. It may come as a surprise to the UAF propagandist who penned the piece that both I and the vast bulk of EDL members and supporters would agree in full with the wishes expressed in the headline, for we roundly condemn genocide, murder and the pathological contempt for human life displayed by Anders Breivik. Their heading amply demonstrates that UAF supporters are not being rallied to protest against a real ‘threat’, but against a fantasy construct designed to generate stigma and hate. I am sure that the EDL would welcome those considering marching with UAF on Saturday, were they to march alongside the EDL against the neglect of cases of anti-White racism such as that displayed in the attack upon Rhea Page and her boyfriend and the recent murder of Danny O’Shea. “The EDL are made up of members and ex-members of the Nazi BNP, Combat 18 and other racist and fascist hooligan groups. Their members have been convicted for racist assault and arson on Mosques and are frequently photographed making Nazi salutes on their demonstrations. They do not respect the democratic rights we have all fought to uphold. 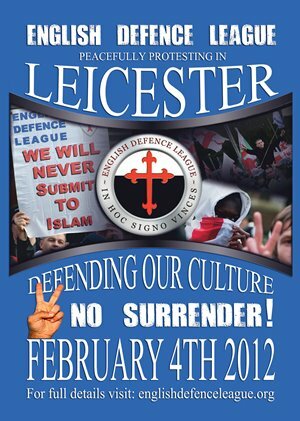 This is why we cannot allow them to March through the city centre of Leicester unopposed. These paragraphs can best be described as odd, deliberately misleading, insulting and ignorant: ignorant of what the EDL are; ignorant of the concerns that they articulate, and ignorant of any aspect of history that is not fixated upon Nazism. These people within UAF display a peculiar obsession with Nazi Germany, yet ignore other horrors of history such as Maoism, Stalinism, Leninism and of course the birth and spread of Islam. It is probable that other than a most cursory and superficial acquaintance with tendentious histories of slavery, imperialism and the Communist movement, these people remain predominantly ignorant of the riches and instructive experiences of history. The UAF's demonstration in Leicester on Saturday 4 February is unnecessary and wrongheaded (wilfully so). The EDL demonstration on the other hand, is sadly necessary. If only it weren’t.